« A hat trick for STAY HIDDEN! Book #2 in the Harper McDaniel series is out now! Despite Harper McDaniel’s best efforts, the man responsible for the murder of her husband and son was exonerated thanks to some slick legal wrangling. This blatant injustice has only made Harper more determined than ever to bring down the culprit. Her ammunition? Incriminating information about his olive oil operations in Italy. But the clues that she follows are leading her into the depths of a corrupt plot that is more poisonous and far-reaching than she realizes. And more dangerous, too, because her enemy is prepared for her pursuit. Accompanied by her brother and mobster grandfather, Harper treks across Spain from Seville to a medieval castle, home to a successful olive farmer who is one of Harper’s closest allies. Shadowed every step of the way by a ruthless assassin, Harper is moving ever deeper into enemy territory—and questioning whom she can really trust on this personal path of justice and revenge. James W. Hall is an Edgar and Shamus award winner. 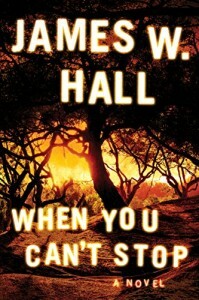 His “Thorn” series of thrillers was recently optioned for TV by Universal Pictures. WHEN THEY COME FOR YOU was a Kindle First pick, called “bold, bracing, and brilliant” by the Providence Journal, and has sold over 23,000 copies since its debut last fall. This entry was posted on Tuesday, September 4th, 2018 at 10:18 am and is filed under Uncategorized.